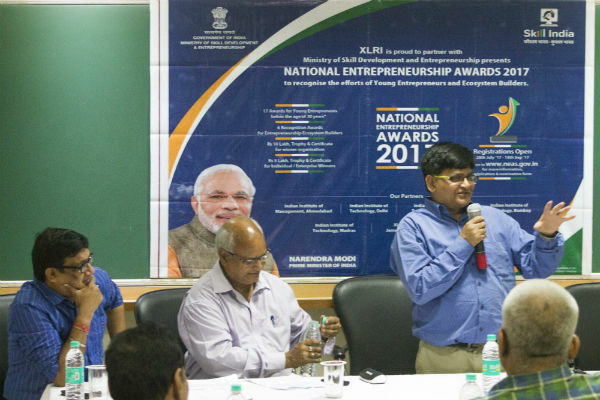 Bhubaneswar: The Entrepreneurship Development Centre at XLRI with XIMB-XUB, organized a road show to share the details of the National Entrepreneurship Awards 2017. XLRI is pleased to partner with the Ministry of Skill Development and Entrepreneurship, Government of India, for the National Entrepreneurship awards 2017. As the key institutional partner, XLRI is playing a crucial role in mobilizing, supporting and encouraging participation in the awards across Jharkhand, Odisha, Assam, Sikkim and North East states. Professor VishwaBallabh and Professor MadhukarShukla are anchoring the initiative at XLRI, with able support from the Entrepreneurship Cell of XLRI. We are grateful to XIMB, Xavier University Bhubaneswar along with student committees XSEED (E-Cell) and IlluminatiX (Media PR Cell) for extending their support in organizing this event. The National Entrepreneurship Awards, now in its 2nd year, aims to award Successful Entrepreneurs in various categories as well as recognize Ecosystem Builders in individuals and organizations working in the field of Entrepreneurship Development. The various award categories are: outstanding youth entrepreneurs, women entrepreneurs, social entrepreneurs, and entrepreneurs from the SC/ST category, entrepreneurs who are People with Disabilities (PWD) and grass root level enterprises. A total of 17 Awards for Individuals and 6 Recognitions for institutes, incubators and mentors will be given across the aforementioned categories. Winners will be selected by a national jury of eminent persons drawn from academia, finance, industry and the social sector. Entrepreneurs below the age of 30 years as of January 1st, 2017, having registered their enterprise as a company or an LLP under the Companies Act, 1956 or Limited Liability Partnership Act 2008, respectively, preceding five years from July 28th, 2017 are eligible for awards. In addition, the candidate must be a ‘First Generation Entrepreneur’ I.e. an entrepreneur who is not in the same line of business as his/ her parents and has taken his own initiative, idea or innovation. Furthermore, the paid-up capital of the business may not exceed INR 1 Crore and the enterprise may have all relevant industry certifications (e.g., FDA, FSSAI, CE, MSME, etc.). A relaxation of five years is provided in the age limit to persons from the SC, ST categories and Persons with disabilities (PWDs) i.e. entrepreneurs from these categories can be below 35 years of age as on January 1st, 2017. In addition to young entrepreneurs, there are six awards for the eco system builders to recognize their contributions in developing entrepreneurial environment and attitude among men/women. To be eligible for recognition, institutes or organizations wishing to participate must either have provided incubation or mentorship services or offered courses on development of entrepreneurship for at least three years prior to July 28th, 2017. Educationists, Advisors and Consultants offering services towards the development of entrepreneurship for three years or more from the date of July 28th 2017 may also apply for Recognitions. Details of the Awards may be found online at www.neas.gov.in . All applications for the Awards must be submitted online at the above web address no later than September 15th, 2017.